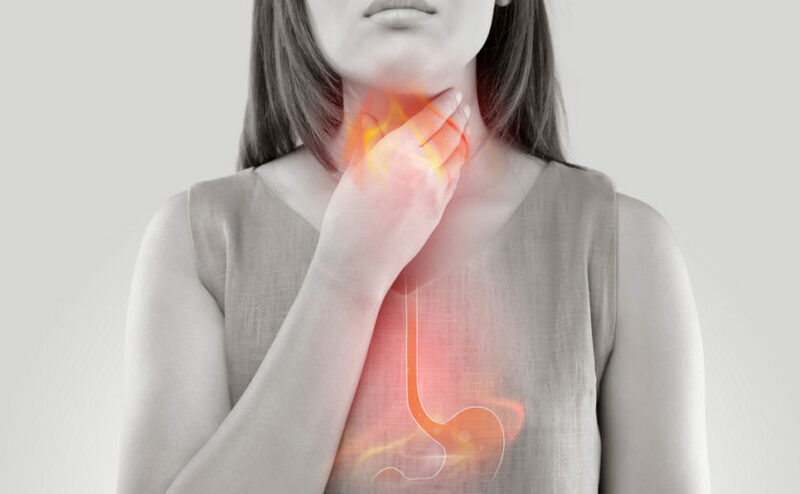 Acid reflux can cause a range of symptoms including a burning sensation in the throat or chest. Acid reflux can be a constant source of unpleasant symptoms that affect how a person eats and sleeps, says Vlaicu “Alin” Botoman, MD, a gastroenterologist at Massachusetts General Hospital. Also known as gastroesophageal reflux disease (GERD), acid reflux is becoming more common because an increasing number of people have obesity, one of the risk factors that contribute to it, Dr. Botoman explains. Another major risk factor is cigarette smoking. Acid reflux usually occurs a few hours after eating, but it can also wake people up from sleep. When we eat, food travels down our tube-shaped esophagus. At the bottom, a valve-like ring of muscles opens to allow food into our stomach. That ring should then close to keep acidic contents inside the stomach. When a person has acid reflux, the anti-reflux valve relaxes for too long and acid and fluid from the stomach escape back up into the esophagus. This can damage the esophagus lining. Acid reflux can cause a range of symptoms. They include a burning sensation in the throat or chest, known as heartburn; a feeling that food is being regurgitated back into the throat; and difficulty swallowing. Dr. Botoman says sometimes heartburn creates such an intense feeling in the chest that patients go to the emergency room fearing a heart attack. In other cases, patients’ acid reflux can affect their vocal cords and cause chronic hoarseness. The good news is that the condition can be managed. It’s normal for adults to experience acid reflux occasionally. When it happens once a week or less and can be relieved with an over-the-counter antacid, it’s not much of a concern, Dr. Botoman explains. “But one of the difficulties with acid reflux is the intensity of the symptoms — meaning how much they bother a person — is not only a function of how much acid reflux comes out of the stomach, but how sensitive that person is inside,” says Dr. Botoman. Stress can make a person’s stomach more sensitive to acid reflux and intensify symptoms. Dr. Botoman encourages anyone who experiences reflux often to discuss it with their primary care physician. Dr. Botoman encourages anyone who experiences reflux often to discuss it with their primary care physician, who can advise about seeing a gastroenterologist. Gastroenterologists can perform endoscopic tests to assess damage and look for Barrett’s esophagus, a pre-cancerous change in the esophagus lining that increases cancer risk and requires monitoring, Dr. Botoman says. For infrequent, mild acid reflux, over-the-counter antacids are recommended. They provide quick, but not long-lasting relief. For patients who have more severe symptoms, there are longer-acting prescription medications called H2 receptor antagonists. They need to be taken twice a day and provide more relief than antacids. The strongest class of medications are prescription proton pump inhibitors. They provide relief and protect the esophagus lining. GERD, much like high blood pressure, can be a condition that requires long-term medication, Dr. Botoman explains. Mass General is also investigating a number of new types of surgery that could help some patients with GERD, Dr. Botoman adds. Making lifestyle changes can help. Chocolates, sweets, peppermint and alcohol, especially red wine, all contribute to reflux. The most important risk factor is weight, Dr. Botoman says. Excess weight is deposited as fat inside the abdomen, between the intestines. This fat increases pressure on the stomach, making it easier for reflux to occur. Losing 20 to 30 pounds can have a major impact, but even five pounds helps in milder reflux cases, he says. Avoiding consumption of certain foods can also be beneficial. Chocolates, sweets, peppermint and alcohol, especially red wine, all contribute to reflux. Other lifestyle changes to consider are stopping smoking cigarettes and avoiding medications taken for other conditions that can relax the esophagus muscles. Eat small, frequent meals, two to three times a day, instead of a large dinner. Eat dinner early, by 6:30 p.m.
Don’t lay down immediately after dinner. An after-dinner walk can help. Do not wear your belt too tight. Place blocks under the head of your bed to elevate it 6 to 8 inches. Or use a foam mattress wedge. To support the work of Dr. Botoman and his colleagues, please contact us.